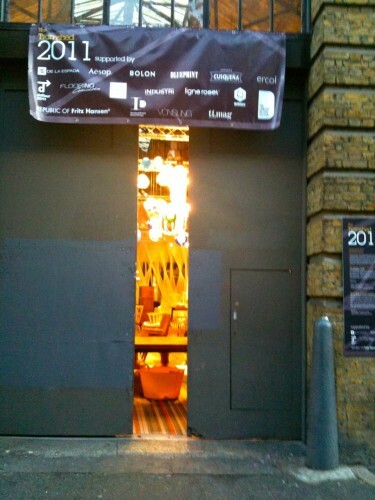 Another smaller show celebrating innovative design and authenticity was Tramshed. Located on Rivington Street in the heart of the artsy Shoreditch Design Triangle, this was the second year for the event during the London Design Festival. Although Tramshed offered many seminars and interactive lifestyle discussions, we just managed a quick whirlwind tour through the loft-like space to become familiar with some of the exhibitors. To the right of the chairs is the shapely King floor lamp, thus named for its resemblance to a giant chess piece – it’s a glamorous and somewhat exotic light also available in a smaller table size – don’t you just love the fabulous turquoise high gloss? 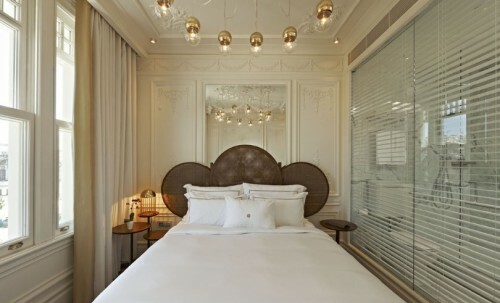 Autoban’s latest design project is the THH Bosphorous Hotel in Istanbul. Their concept was to combine old and new (see why I like them?) incorporating their signature use of luxurious classic materials such as marble, brass, oak and walnut to combine modern design elements with a sense of the past. 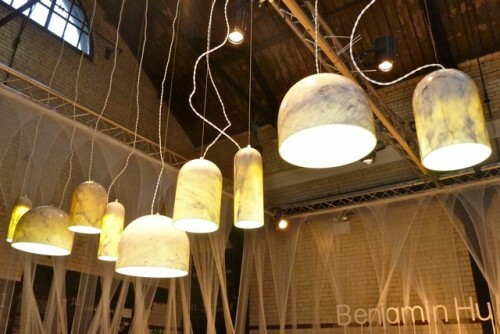 I loved his hand-turned marble Quarry lights. Their luminous quality, like much of his collection, walks the line between the organic and industrial. In the back you can see the dramatic installation he did for De La Espada using debri mesh. Another company in their repertoire is Leif.designpark, a Japanese design studio who have a strong focus on traditional craftsmanship with their emphasis on wood. The Flower Cup chairs have an elegant almost delicate shape. 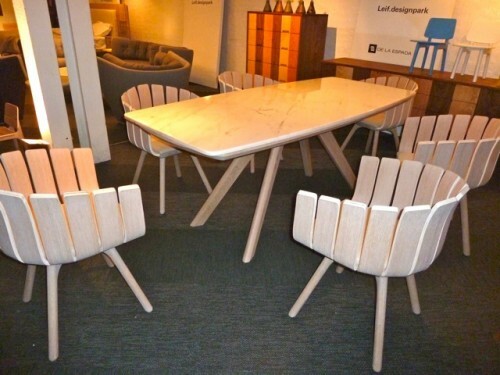 The Lily table is available in other shapes and sizes some with a marble top. 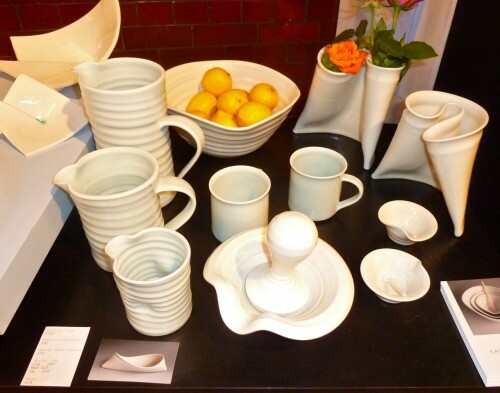 Another designer who caught my attention was Irish artist Karen Morgan, whose innovative porcelain line is a winning combination of sculptural handcrafted pieces with a contemporary minimalistic flair. 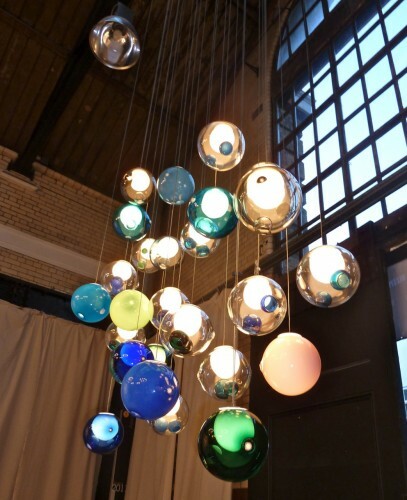 It was impossible not to be entranced by Canadian lighting firm Bocci’s exquisite 28 series by Omer Arbel. Each hand blown 28 is created from a proprietary complex glass blowing technique. Resulting in distorted spherical shapes with inner forms, one of which is made of opaque milk glass housing a low voltage light, each 28 globe is unique. 28 series from Bocci on Vimeo. Lastly, I loved the very interesting work of John Reeves of REEVESdesign. This piece from his SKETCH collection reminded me of the architecture of Antonio Gaudi. Reeves, who I chatted with briefly, said he had heard that reference before. He describes the fluid and organic form of the collection as capturing “the tension between the stationary and the moving, the living and the inanimate, the man made and the natural”. It’s all about the juxtapositions. I also loved his Aqueduct Bookcase. I’m using the product shot because it was very hard to capture the beautiful brass interior lining. Reeves’ designs are available here in the States at abc in NYC. Tramshed was another great design venue. In the best of all possible worlds it would have been fabulous to attend some of their seminar series which encompassed discussions with designers, manufacturers, producers and journalists. A couple of of the interesting topics included “The Designer’s Craft” and “So You Want to Launch a Design Brand?”. If you’d like to have more of a feel for Tramshed, take a look at this lovely video filmmaker Juriaan Booij made for De La Espada. We really needed another week to cover all that there was to see – you reading that Veronika? 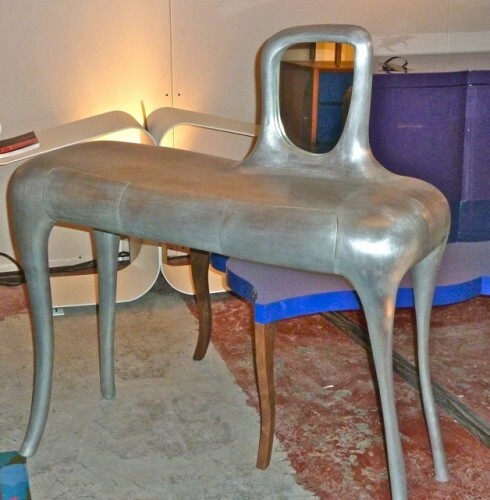 This entry posted in art, BlogTour, design, furniture, interior design, lighting, travel. Entry Tags: BlogTour2011, Karen Morgan ceramics, Leif.designpark, London Design Festival, REEVESdesign, Tramshed Bookmark the permalink. 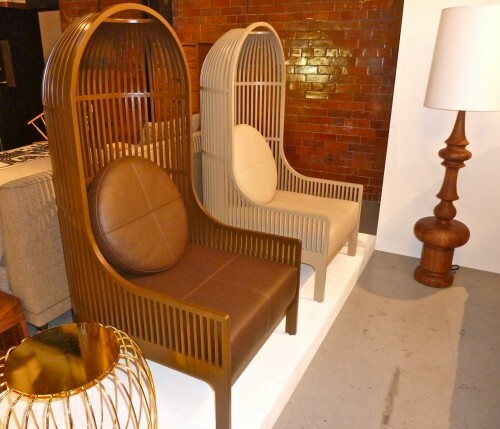 Thanks for the introduction to De La Espada – I love those nest lounge chairs! You must have left so inspired – so much to see! Love the Karen Morgan ceramics. I think my morning coffee would like quite pretty in one of her cups! Love the pendents and the black book shelf especially! Great things here! Love all of it, especially the Bocci lighting. I have always loved colored glass pendants, but they’re not so popular anymore and look dated. This is a more modern way to use that same concept. LOVE. Think I need the Karen Morgan curling vase! I’ll take the lounge chairs, the lamps and the cool bookcase please! Wow, the bookcase with the brass is amazing! 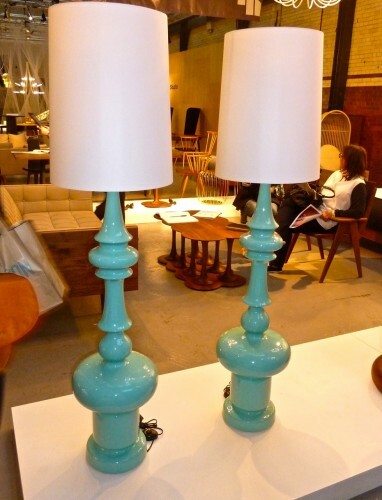 turquoise high gloss lamps, oh my!!!!! Many beautiful and innovative finds!! Love the pendants, great looking things you got to see. You must still be on a major high from that trip! I’m hearting those turquoise lamps! You have done an amazing job capturing all that you saw – which was obviously a lot!!! It must have been hard to come home empty handed. The organic ceramics captured my heart. So many great things! I especially love the Aqueduct Bookcase. 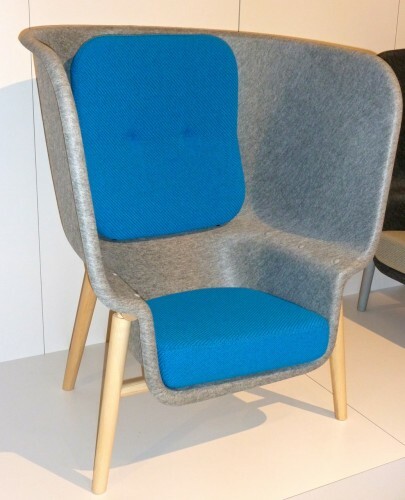 Love the nest chairs – did you sit in them – what was the comfort level? Hi BJ – I’m so sorry but I just don’t remember since it was quite a while ago now. Sorry not to be able to help you at this point!